Located amidst the Garhwal Himalayas and the mystically flowing Mandakini River, Kedarnath is one of the twelve Jyotirlingas of Lord Shiva. 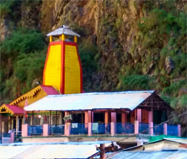 It is also a rich site of Chota Char Dham Circuit in Uttarakhand. 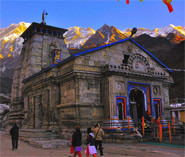 Kedarnath Mandir which looms at an altitude of 3,584 meters attracts devotees of Lord Shiva from all across the globe. At the sacred temple people very religiously worship Lord Shiva as ‘Lord of Kedarkhand’. Being most important temple among the PanchKedar (group of 5 Shiva temples in Garhwal Himalayas), makes this holy shrine more glorious. Kedarnath Mandir opening date depend on the Akshaya Tritya day. Temple usually gets open for pilgrims in the month of April-May and closes after Diwali in November. Due to harsh winters the holy shrine remains closed for six months. The sacred deity of Lord Shiva is brought down to Omkareshwar Temple in Ukhimath where the prayers continue. Start planning your trip today as Kedarnath Dham opening and closing dates for the year 2019 has been announced. 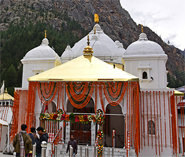 Kedarnath Temple opens at 04:00 am daily with Maha Abhishek Pooja and aarti. Whole temple premise echoes with the chanting of hymns and ‘Jai Bhole’. The complete pooja concludes till 07:00 am. Evening aarti and other pooja starts from 06:00 pm till 07:30 pm. Pilgrims must attend morning or evening aarti of Lord Kedarnath. Gaurikund is the starting point of the trek to Kedarnath Temple. This beautiful ancient temple dedicated to Goddess Parvati. It is believed that Parvati meditated over here to please Lord Shiva. This is also the same place where Lord Shiva agreed to marry Parvari. It is an enchanting lake situated at an altitude of 4,135 metres. One has to cross the Chaturangi and Vasuki Glaciers which lie en-route to the lake. Vasuki Tal offers a splendid view of nearby Chaukhamba peaks. Chopta is a scenic hamlet in Garhwal region. People from all across the globe come to allure the beauty that this place hides. The panoramic view of Himalayan ranges like Nanda Devi and Chaykhamba from Chopta is indescribable. The trail to Kedarnath Dham is a long and tiring one. But the spiritual spirits in pilgrims don’t stop them from taking the pious journey. The motorable road to Kedarnath stretches till Gaurikund. From Gaurikund, only way to reach temple is to take the 18 km trek route. The motorable road to Kedarnath ends at Gaurikund. Gaurikund is well connected by road with major cities of the country. Buses and taxis to Gaurikund are easily available from major destinations of Uttarakhand like Rishikesh, Tehri, Haridwar, Dehradun and many more. Jolly Grant Airport, Dehradun is the nearest airport to Kedarnath situated at a distance of 238 km. From here one can hire a taxi or take a bus to Gaurikund. Rishikesh Railway Station is the nearest railway station to Kedarnath, at a distance of 215km. This railway station is well connected to major cities of India. Trains are also available from Haridwar (238 km), Dehradun (257 km) and Kotdwar (246 km) and many other destinations. The weather conditions in Kedarnath vary drastically. This is the reason the temple remain closed for six months during winters. Winters are freezing cold with sub-zero temperature and roads get covered by snow. The cool and pleasant climate of the months May to June and September to October makes it the ideal time to visit Kedarnath Dham. In Kedarnath, summer welcomes you with cool and pleasant weather. Summers begin from May and last till June. The temperature ranges from 4°C to 18°C. 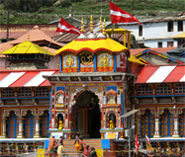 It is the perfect time for temple visit and to explore the nearby places in Kedarnath. End of July, August and September months mark the beginning of monsoon season in Kedarnath. Heavy downpour makes the trek route difficult and landslides also take place. One should be well prepared if they plan to visit Kedarnath Dham during monsoon. During winter Kedarnath temple remain closed. Winters are harsh and temperature falls to sub zero. Kedarnath remain covered with heavy snow which makes the trek route unreachable.